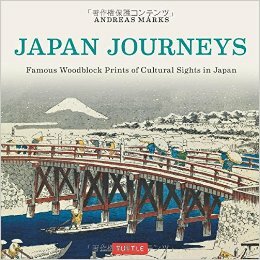 Japan Journeys is a collection of woodblock prints of Japanese sights, cities, landmarks, scenery, people, architecture, and more. Most were created in the eighteenth or nineteenth century, but a few more modern (early twentieth) are included. The book is divided into four chapters: Sights of Tokyo, Sights Around Tokyo, Sights of Kyoto, and Sights of Japan. Sights of Tokyo, for example, includes the famous painting The Great Wave by Hokusai, but also many others which give a delicious banquet of the people and places there. Of course, Mt. Fuji features largely through these pages, but beauty is found in both the large and small, the natural and the man made. Women wear kimonos and carry brightly colored paper fans; carriages are pulled by horses or humans, bridges and buildings contrast the stark beauty of the natural world. Each painting is captioned with its title and a tiny background, for example explaining where the painted waterfall is located, or who the portrait portrays, or what is happening in the picture. Some sections have more detailed explanations, so readers will learn a lot about Japanese history and geography as they peruse the detailed woodcuts in this beautiful book.